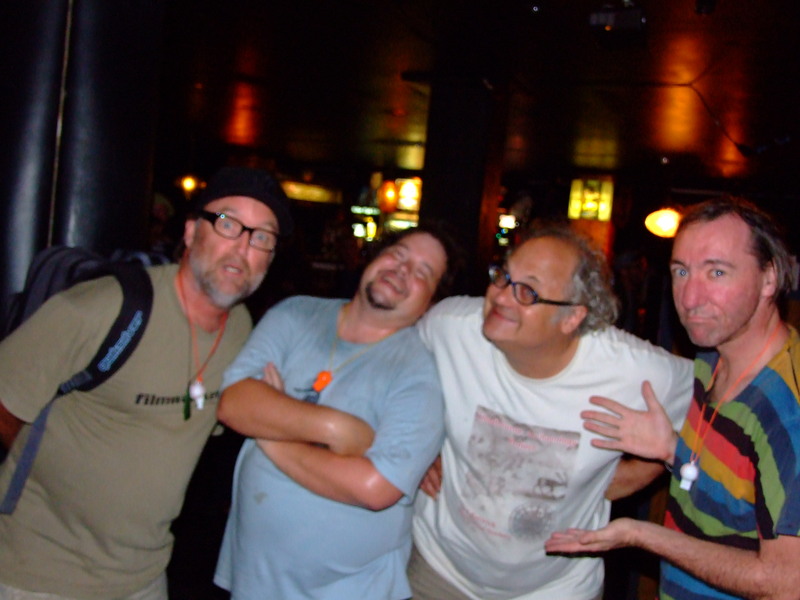 Axemen, Dr Chad clowning at the Whammy Bar - L-R Stu Kawowski, Steve McCabe, Emeritus Professor the honourable and distinguished Dr Eugene Chadbourne, Bob Brannigan - Bob Brannigan: "You guys should know - where can I get some food around here?" 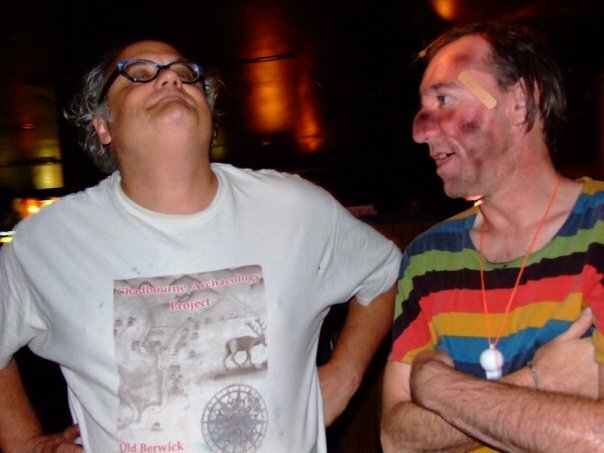 On 29 Jan 2009, the Axemen fulfilled one of their lifelong dreams, meeting and playing as humble support to legendary musicologist, Shockabilly geezer, generally dexterous solo artist and fellow mayhem cohort Dr Eugene Chadbourne. The Axemen played a short sharp set as a 3 piece, the first time in 16 years Stu Kawowski, Bob Brannigan and Steve McCabe had publicly aired their particular brand of rock’n’roll as a cohesive unit, and sounded as if they had never put down their instruments. On the verge of the worldwide re-release on new vinyl of their legendary 1984 protest album “Big Cheap Motel”, the lads whisked through a timewarp of tracks covering many crucial aspects of their long, speckled and bespectacled career – the Dunedin years, the Christchurch years, the Frisbee sessions, the Auckland wilderness years – all encapsulated in their electrifying 20 minute set. 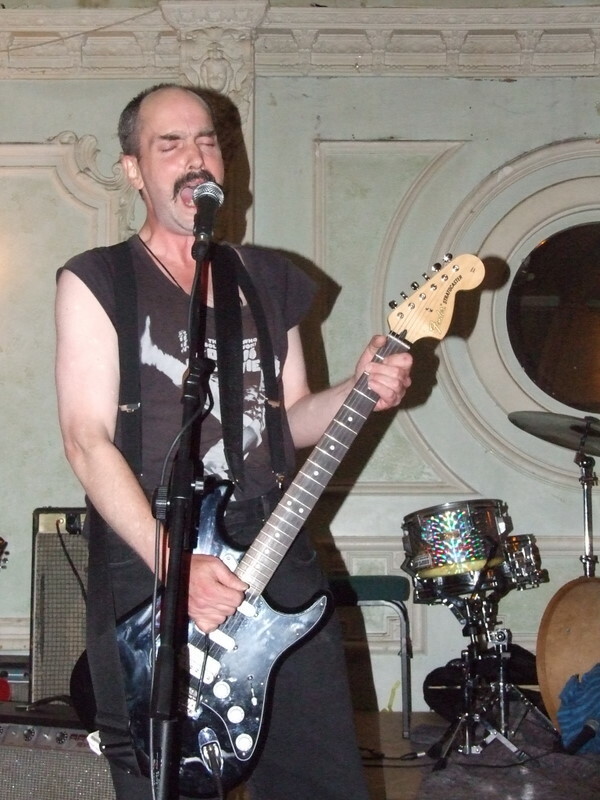 After complimenting the boys, (“Wild set guys!”), Dr Chad proceeded to perform a chilling fingerpopping solo banjo set before taking a quick break, during which time McCabe stumbled across the stage to pick up his guitar and inadvertantly stepped on Eugene’s infamous electric rake, inflicting horrifying facial injuries which doctors say will likely scar him forever (“that’s rock’n’roll!” McCabe shrugged to the waiting papparazi). Steve McCabe puts on a brave face after standing on Eugene's rake - Dr Chad tries to make amends for tying his shoelaces together by playing him a song on one of them. After playing a blistering set with the Vitamin-S guys on bass, drums/percussion, stratocaster-slide and vibraphone the Chad-meister, obviously fired up and hepped out on steroids, pushed his way across the bar to Bob Brannigan and proceeded to arbitrarily pick a fight with him, deliriously warbling about being the best pummeler in the land of the long white cloud… Brannigan, in a foul mood after missing his evening insulin shot, stepped up to the plate, accepted the challenge and proceeded to take the pounding of his life. "I'm a Bully! ".....EC: Repeat after me - "Eugene is the best pummeler in the land of the long white cloud!" 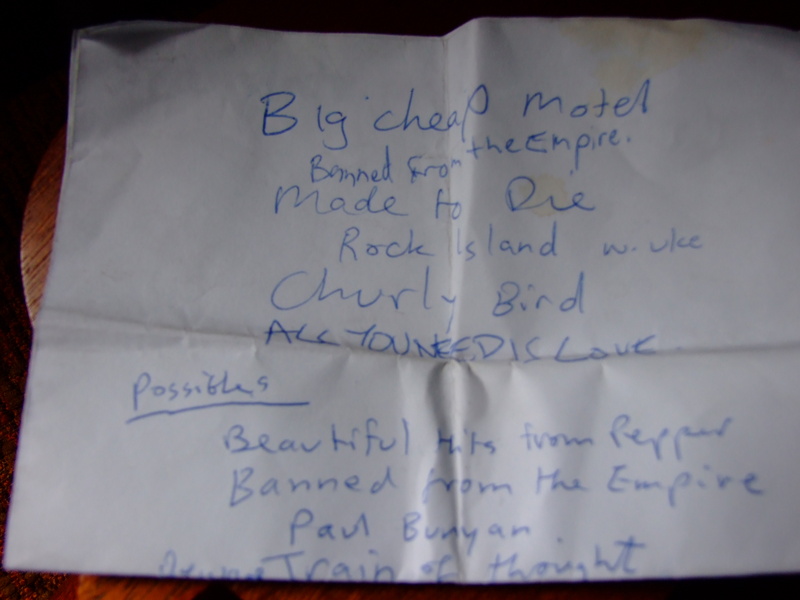 At the recent MONSTER GIG at Christchurch’s glamorous crumbling Media Club, Bill Vosburgh handed Kawowski a single A4 sheet with a few paragraphs written on it all in capitals, relating to his earliest recollections of THE AXEMEN days in Christchurch (1983-1987). 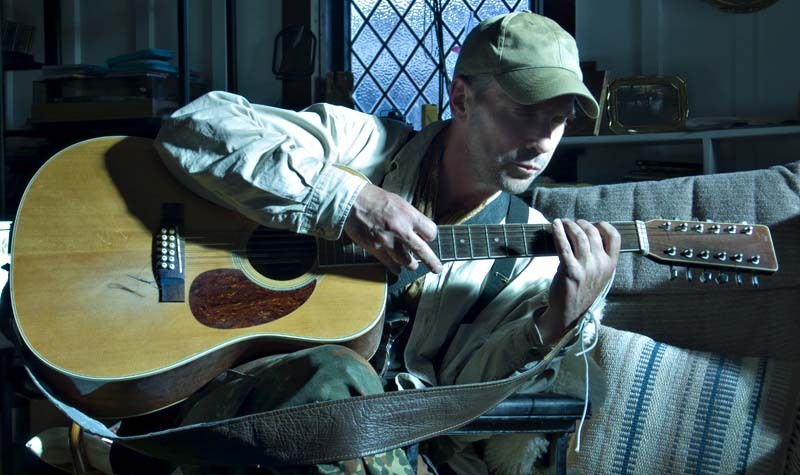 Luckily he stuck around and performed an incendiary blues rock set that night, as well as jamming with Steve, Stu & Helm at 4am New Year’s Day out at South Brighton, and also playing a few songs on various acoustic guitars on subsequent visits to Kawowski’s seaside hideaway. I REMEMBER WATCHING THE AXEMEN PLAY AT THE GLADSTONE AND THE FIRST 45 MINS CONSISTED OF STEVE FIDDLING AD INFINITUM WITH HIS ‘PAUL BUNYAN MACHINE’. 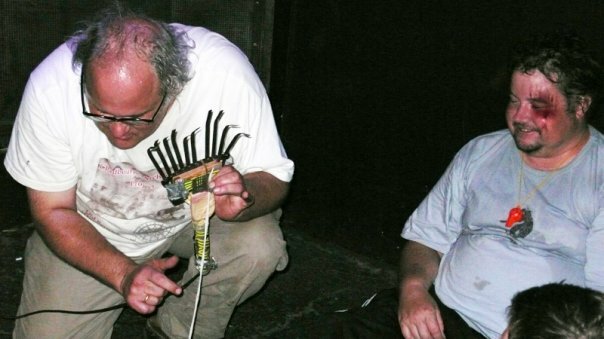 AN ENTHUSIASTIC AMATEUR ELECTRICIAN, STEVE HAD SOMEHOW ATTACHED A FUZZ-BOX AND IT TOOK HIM THAT LONG TO FIX IT WHILE BOB AND STU MANFULLY IMPROVISED IN THE BACKGROUND. AFTER A WHILE, THEY TRANSCENDED THE COMICAL AND THE PIECE BECAME A SURREAL EPISODE OF PERFORMANCE ART. AS I RECALL, THE AXEMEN WERE INCREDIBLY PROLIFIC, AND THEIR RECORDINGS, WHICH WERE PRIMITIVE TECHNICALLY IN THE EARLY STAGES, CAME THICK AND FAST. THEY GOT SOME LIMITED SUPPORT FROM RADIO U.
STU KAWOWSKI WAS AND IS A MARKETING GENIUS AND PRODUCED NOT JUST T-SHIRTS, BUT TROUSERS, STICKERS ETC, AND PRODUCED A MURAL THAT STOOD PROUDLY IN CHRISTCHURCH FOR OVER 10 YEARS, AS WELL AS MANY OTHERS THAT DIDN’T LAST SO LONG. ALL IN ALL I WOULD HAVE TO SAY THAT THE AXEMEN ARE ONE OF THE LOOPIEST AND MOST ORIGINAL BANDS I’VE EVER SEEN AND I’M GLAD THEY’RE BACK ON THE ROAD. A NOTE ABOUT STEVE’S COFFEE WINE: STEVE MADE THIS COFFEE WINE AND THEN DISTILLED IT – STRANGEST ALCOHOL I EVER TRIED. IT WAS MORE LIKE A BARB, AND I RECALL WALKING ACROSS THE SQUARE AFTER A COUPLE OF SHOTS AND HAVING TUNNEL VISION!